Pugs are just so cool! We are pug crazy here at Art Paw. 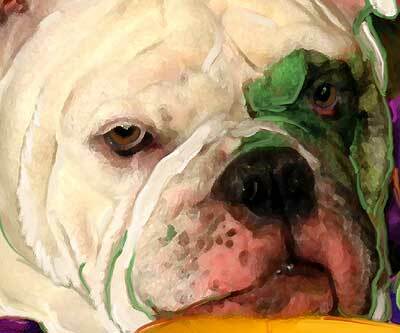 We have created pop art pugs, painterly pugs and even placed a pug or two in Mona Lisa's lap. 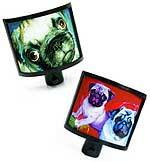 We have just updated our pug art section here to make your holiday shopping easier. Check out our main pug shop or browse our original pug art samples to the left of this page to get ideas for your own custom puggie portrait. 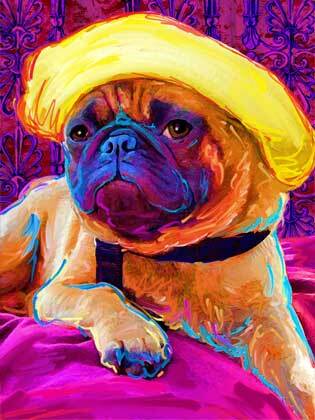 If you can't wait for custom work our Pug Art Prints and Posters might just do the trick. 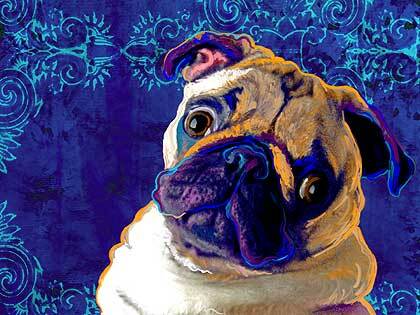 We even offer a really cool Pug Portrait Gift Certificate that includes our Portfolio on DVD! "I am a devoted "terrier woman" that just happens to be in love with another breed ... Pugs. I have always been drawn to unusual beauty. Many people say pugs are just so ugly they are cute and I'm not so sure that is how I would describe them. I really can't find anything ugly about them. I love their large eyes, and adore their wrinkled little faces. They have handsome little bodies and perfect curly tails. They just make me smile. My heart was first stolen by a client's pug by the name of Murphy. Many of our long time visitors know Murphy well. I became pretty good pals with murphy's Mom and got to learn more about their personality. Their independence and feisty nature reminds me of my own Scottish Terriers. I think that my love for chinese pugs shows through in my artwork and I strive to make each piece as unique as my subject matter."